Nominated for 11 awards, of which it won 7. Nominated for Supporting Actor (Alec Guinness), Directing (George Lucas), Best Picture (Gary Kurtz), and Writing-Original (George Lucas). Won Art Direction (John Barry, Norman Reynolds, Leslie Dilley, Roger Christian), Costume Design (John Mollo), Film Editing (Paul Hirsch, Marcia Lucas, Richard Chew), Music-Original Score (John Williams), Sound (Don MacDougall, Ray West, Bob Minkler, Derek Ball), Visual Effects (John Stears, John Dykstra, Richard Edlund, Grant McCune, Robert Blalack), and a Special Achievement Award (to Benjamin Burtt, Jr. for the creation of the alien, creature and robot voices featured in the film). 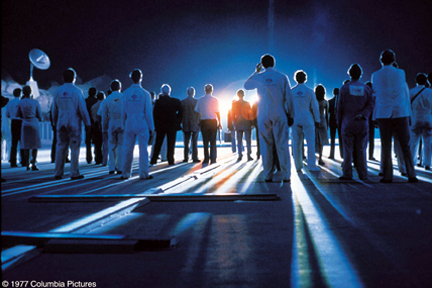 The second science fiction film to be nominated for an Academy Award, the cult classic, the household names, and the instant launch into stardom all began at one unbelievable place on the set of a film with a tiny budget comprised of a crew who didn’t believe in the project. 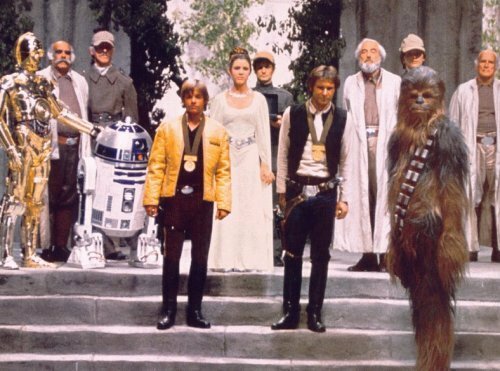 Star Wars came into our lives at the precise moment that our culture was able see its greatness and make it such a huge success. The original owners of the movie studios were all retiring and selling them to inexperienced corporations. At a time when our American heroes and leaders were a part of the Watergate scandal or engaged in the Vietnam War, George Lucas was exploring mythology and religion, trying to piece them together into a simple coming of age story where good and evil are clearly defined. Only because of the technology of the time, the simple story turned into a monumental, nearly impossible task. The science fiction culture, as well as the other genres of the time, were preoccupied with death and destruction, taking lead from the world that surrounded it. In the end, it took a very special man at 20th Century Fox, Alan Ladd, Jr., who believed in the man but not in the project, to get Lucas his 8.25 million dollar budget and launch the film. Lucas, an independent filmmaker who had recently stepped away from experimental films and was still determined to stay out of Hollywood, wanted to do everything his way without the studio’s suffocating tampering he had experienced in his other projects. He took six months to cast the film and did his best to choose no-names for the three key characters. While he was still elbow deep in preproduction, his big hit American Graffiti was finally released and the studio gained a little confidence in him. The story line is simple. A young farm boy named Luke who longs for adventure outside of his home crosses paths with two wanted droids that lead him to the doorstep of Obi-Wan Kenobi, an old Jedi Master. The Jedi are apart of a religion almost forgotten to the past. One of the droids contains important information for the rebellion against the evil Empire, and seeing that they are the only hope, Luke and Obi-Wan enlist the help of the smuggler Han Solo to fly them to the rebel base. It doesn’t take long before they are caught up in something much bigger than they had anticipated–rescuing a princess and piloting X-Wing fighters among them. As the story progresses, Luke slowly begins to discover his skills with The Force, and ultimately uses them to deal the Empire a crushing blow. 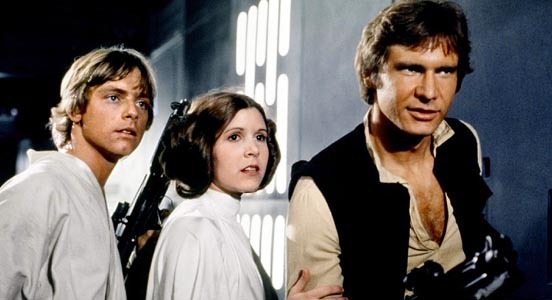 Initially, Lucas refused to consider Harrison Ford for the role of Han Solo because he had worked with him before (remember his goal of casting no-names), but recognizing his talent, Lucas asked Ford to help him in casting by reading with the auditions. 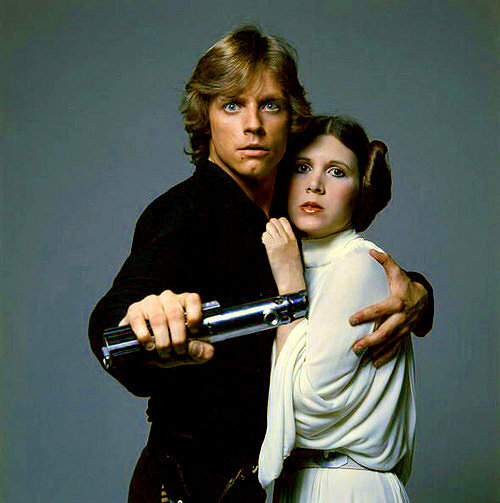 Eventually, inevitably, Ford’s connection to the character and spot-on interpretation of his mannerisms won him the role, and he was joined by recent TV phenomenon Mark Hamill as Luke Skywalker (originally named Luke Skykiller), and the not so common damsel in distress Carrie Fisher as Princess Leia. 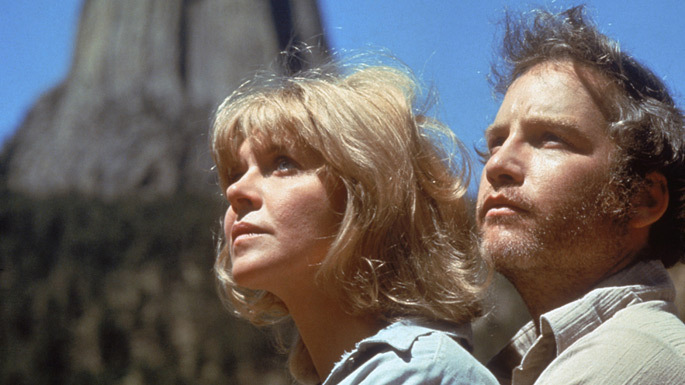 The shooting of the film was plagued with misfortunes, mostly with unpredictable desert weather, malfunctioning robots, and differing styles between director and cinematographer. 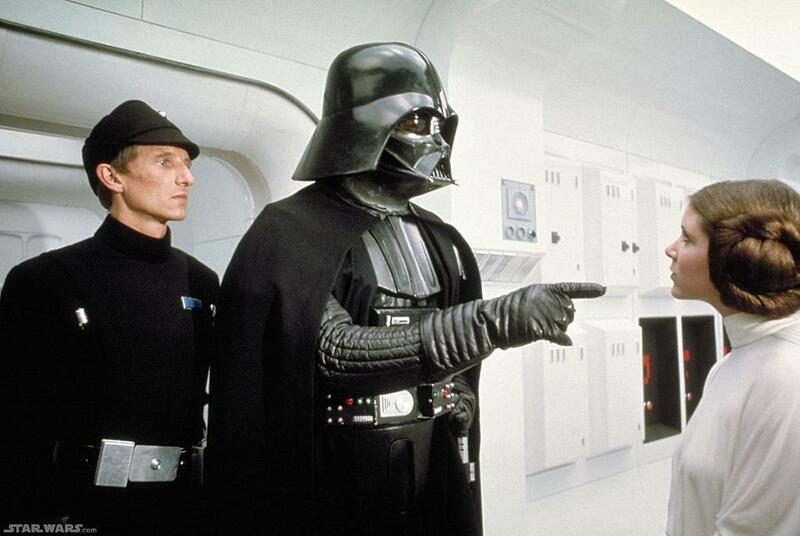 No one on set really understood Lucas’ vision or the story and therefore there was not a lot of belief in its success. The studio was constantly breathing down his neck, and when the shoot went over schedule by three weeks, there was the threat of pulling the plug. Meanwhile, the special effects department had been working for a year, spent half their budget, and had only filmed four shots, none of which Lucas liked. His stress level reached an all time high and he had to go the hospital with complaints of chest pains. Immediately, he stepped in and took control of the special effects department, setting deadlines and making regular trips to visit, insisting that they do a year’s worth of work in six months. Their hippy mentality finally got into gear, and although Lucas was never truly satisfied with the results, the immense progress they made completely changed the department and the art of filmmaking from then on out. But before the music was complete, Lucas showed one of his first cuts to a group of friends, almost all of whom gave him fairly negative reviews. Only Steven Spielberg recognized it for the genius that it was. To Lucas’ astonishment, the studio loved it, and several of them actually left in tears, knowing they would always remember the day they had witnessed such a film. When the film was released on May 25, 1977, it was pandemonium. Only around 40 theaters had agreed to show the film and in its first weekend it made over 35 million dollars, breaking all sorts of records, and not just for science fiction films. It became one of Fox’s highest grossing films at the time, and the real kicker is that they had no interest in merchandising when they created Lucas’ contract, which means that he was set up to make an incredible amount of money from the inevitable cult following that began even before the film was released. This was thanks in part to the marketing department and their use of the famed Comic Con convention in San Diego and their release of a novel just six months prior to the film’s release. The film itself was a great feat for the time of its release. The acting is not the best, and the special effects certainly aren’t up to today’s standards, but its incredible and genius utilization of story, characterization, and imagination, are what help it stand the test of time. George Lucas’ vision was much too grand for the time in which he was born, but it is because of this that he pushed the boundaries of cinema and created the first ever science fiction blockbuster, thus changing the whole idea of film. If you have somehow never seen Star Wars (you know who you are), drop what you are doing right now and please enjoy this incredible film that changed the tides of filmmaking for the better. Nominated for Supporting Actor (Mikhail Baryshnikov), Best Actress (Anne Bancroft), Best Actress (Shirley MacLaine), Best Supporting Actress (Leslie Browne), Art Direction (Albert Brenner, Marvin March), Cinematography (Robert Surtees), Directing (Herbert Ross), Film Editing (William Reynolds), Best Picture (Herbert Ross, Arthur Laurents), Sound (Theodore Soderberg, Paul Wells, Douglas O. Williams, Jerry Jost), and Writing–Original (Arthur Laurents). The Turning Point would today be considered a Lifetime movie, Oscars-style. To have been nominated for eleven Oscars and win none of them has only happened twice in the Academy’s history. To be honest, a few of the nominations seemed a bit excessive–namely the supporting cast. The film was apparently a big hit when it came out, and should certainly be on the favorite list of today’s dancers, but it is another prime example of a film not standing the test of time. Despite its flaws, this film is very relatable. For anyone who once had a dream, and ended up taking a different path, or outgrew it, the story line will strike a chord with you. It is about a woman named Deedee (Shirley MacLaine) who gave up the opportunity of being a prima ballerina to get married and have a family. One day when her old company comes into town, her oldest daughter is invited to join. Deedee accompanies Emilia (Leslie Browne) to New York, just for the summer, and immediately feels out of place. It is not her time anymore, and it seems the light is dimming on her old friend and rival, Emma (Anne Bancroft), who might just be nearing her last dance. To see the ins and outs of a dance company is something we are familiar with in films these days, but to see such exquisite dancing, we are not as accustomed. Granted, as the Step Up films certainly highlight their genres very well, The Turning Point does the same with ballet. Its consistency with the story is a bit lacking, but unlike many critics I enjoyed this. I found it more realistic and consistent than, say, a musical. The characters themselves are in fact dancers, and when they practice and perform the dance consumes them, but in their outside lives they are not as likely to break into song and dance. Considering the fact that neither MacLaine or Bancroft were dancers, they did a very good job assimilating themselves into their environment. Their relationship is strained, almost fake, because of long-harbored resentment toward each other. They both long after the life the other person has and are filled with regrets. The film is preoccupied by the life decision between career and family, which doesn’t give the actors too much range to work with. The climactic confrontation between the two main characters inevitably comes, and after a lot of harsh words and a drink thrown in MacLaine’s face (which was unplanned and thus her reaction is of genuine surprise), turns into a full-out cat fight that was quite hilarious. Overall, unless you are a lover of dance or a fan of Lifetime movies, I would not recommend this movie for you. However, if you have any appreciation for ballet, I suspect this is already one of your favourite films!